TRIGGER WARNING. THIS ARTICLE HAS VARIOUS DESCRIPTIONS OF SELF-HARM THAT MAY BE TRIGGERING. PLEASE READ WITH CAUTION. It can be hurtful when your method of coping is called disgusting or crazy. On the other hand, being told that self-harm is beautiful or artistic can be just as damaging. Self-mutilating doesn’t make you a bad person, but it is far from being something good, even with the possible positive side affects. We should support the individual who self harms, but not the self-harm. How is self-harm romanticized? This idea is really open to interpretation and it’s hard to classify what is and what isn’t romanticized. Sometimes you might not even do it on purpose. For me, romanticizing self-harm was trying to make it something greater than just a reflex for when I was feeling down. Very often it would become something symbolic. Before self-harm my skin was relatively blemish free as well as very pale (still is pale, of course. Sun isn’t my friend). The scars would physically and symbolically be a blemish on a once pure and innocent body. A body previously innocent from dark thoughts was now littered with sad and angry marks. Sometimes it was a bit of retaliation. After my first boyfriend broke up with me I cut an image of a heart directly above my own. I did it both to imitate a heart necklace he had given me, as well as convince myself that like this scar, my heart would not heal from the rejection. Consequently I would not let the scar heal. Even after I was fully over the break-up, the scar adapted to any new feelings of rejection I had. In a way it was revenge that ironically would hurt no one but myself. These thoughts and things I did made it almost impossible for me to quit. I wouldn’t just be giving up the relief generated from a few cuts; I would be giving up my art – no matter how sick and gross it was. Where did I come up with the idea to romanticize my self-harm? I don’t really know or at least I can’t remember. I’ve always been very poetic and loved symbolism, so it’s possible I just connected that with the self-harm. But what I do know is that I see self-harm romanticized all over. Taking pictures of self-harm is quite popular. Some people post pictures of cuts with black and white filters (maybe an attempt to be artistic, or maybe too look less shocking than bright red blood). Oftentimes you’ll see pictures of tools or bloody tissue from clean up. Razor blade shaped pendants have become popular necklace charms. Once in a while you might see photoshopped pictures of blood running into heart shaped pools. Some people might post these simply because they need to tell someone, even if it’s random strangers on the internet, what they are doing or want to do to themselves. Not only are these things strong triggers, but they can also give the impression that self-harm can be beautiful. And although someone can be beautiful even with his or her scars, self-harm itself is never beautiful. Unfortunately, there probably isn’t a whole lot you can do about these instances. If you self-harm try not to think of it as something beautiful. It is a coping technique, and sometimes it helps, but don’t try to fool yourself into thinking it isn’t a problem. Even if it’s hard to quit, and I know it is, don’t think it’s something you can never stop doing. You can get through it. 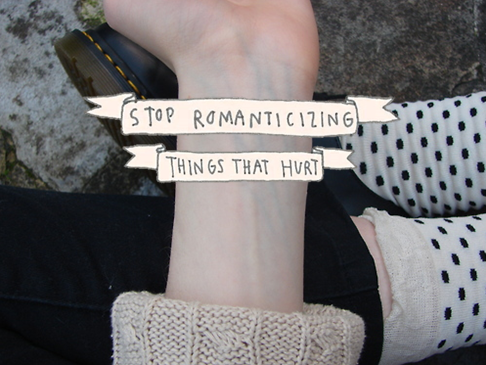 And if you see others romanticizing self-harm, don’t condemn them. Sometimes it may be unintentional. Others may use it as a coping technique. Offer them support and let them know that their self-harm does not define them.